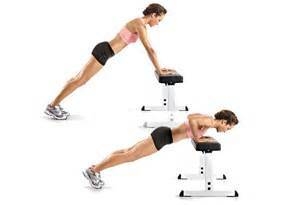 The challenge of a push up for many is the core stability needed to maintain your torso and hip position. Master proper core stability of your pushup by making your knees, instead of your toes, the pivot point at first. Here’s how: Place both knees on the floor and hold both feet up off the floor. Next, place both hands slightly wider than shoulder-width flat on the floor. Pull your belly button up toward your spine to maintain your torso position. Then, bend both elbows lowering your chest to the floor. Finally, straighten both elbows and push your body up to complete one rep. Begin in a push-up position. Pull your abdominal muscles in tight, with your spine aligned. Inhale and lower your body down toward the floor. Immediately upon extending your elbows, exhale, push up and jump both hands off the floor. Land gently, lowering your body down toward the floor to complete your rep. Begin with 5 repetitions. Pushups for total body fitness! Don’t hunch your shoulders! Keep your shoulders away from your ears. Drop your chin to your chest to keep your neck aligned with your spine. Don’t sag in the middle. Pull your belly button up to your spine. Keep your leg muscles tight with your hips in line between your shoulders and your hips.